How many bloggers are there who wants to replace "Followers" Title With an Image in Blogger Siderbar?. Today i received a mail from TheoMat, asking help and hence inspired me to write this post on the topic of how to replace Google Followers title with image in Blogger sidebar. I have already made a post about How to Replace Sidebar Widget's Title with an Image, but this hack will apply for all the widget's excepting Google provided "Followers" Widget. #Step 2.Copy below code and paste it just before the ]]></b:skin> code and save template. This code will hide Title from the "Followers" widget. #Step 3. Now Navigate to Design > Page Element Tab. #Step 4. Add your image code just above the Follower Widget(refer below screen shot). 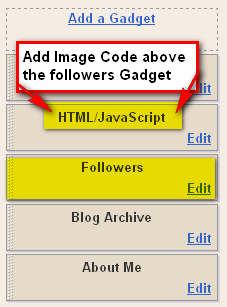 Get free information related to "How to Replace "Followers" Title With an Image in Blogger". Thanks to you, my page is beginning to look somewhat decent! I'd been trying this one for awhile and gave up figuring I just wasn't seeing the path needed. You are a great help!